GERMAN STEEL + BRITISH DESIGN = PRECISION. BALANCE. CONTROL. 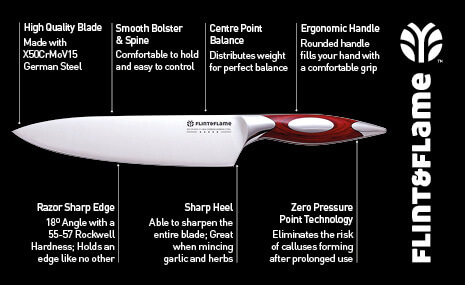 Flint & Flame knives are crafted and designed with you, the cook, in mind. The high quality German steel is not only of a superior quality grade so that the sharpness will last even in the busiest kitchen, but it is also soft enough so that an edge can be easily put back on with our handheld sharpener so that you never lose the ability to use a razor sharp knife. The beautifully contoured ergonomically designed handle incorporates our unique Centre Point Balance (CPB) technology, which gives you excellent control and precision. And our unique Zero Pressure Point (ZPP) design eliminates the risk of calluses’ forming after prolonged use, a real must for home and professional chefs. You can purchase now from our online shop and at one of our events and shows – follow the link to find an event near you.